Hi Chris. It's nice to re-connect after all these years. Alan and I met through mutual friends while I was a student in Gainesville and he and Donna were still living in Miami. I recall seeing the original Time Electric on a visit to their home. 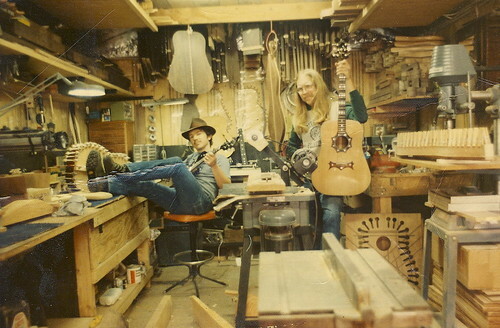 By '73 he had moved to Bristol and set up the shop in the photo and asked if I'd like to come to Vermont and work with him. I apprenticed for a year or so, returned to Tallahassee Fl. for a year, then came back to Vermont after he'd set up shop in the Waltham property. Harry Grabinstien (spelling?) had been working for him there and Harry and I were later joined by Robert Resnik. The Waltham place 'went south' and I found other work until the Darrell's Music basement period. I left Time in '82, a year or so before Alan left. I don't know much of what took place after '82 as I'd started a furniture company and was up to my eyeballs, but I do still have the Time brochures you sent to me. I never purchased a Time but had talked to Alan about an unfinished prototype I lusted after. I was, and still am, an incredibly mediocre guitar player but I did love putting them together. Click for more photos of the Bristol Shop on 83 East Street, & more! Those are great photos. You nicely outline the early time period. Was Harry Grabenstein the Renaissance bow maker that later worked with Peter Tourin? Peter was married to my cousin Tina. Small world eh? I also noticed your Bultaco Pics. I'm currently restoring a Model 80 Sherpa T.